Before I say anything about this summer, let me make my stance clear: I hate summer. Period. Well, hot and humid Tokyo summer, that is. Which you might already know, if you know me or you have read any of my past posts written during summer - I've been ranting about it in pretty much all summer and every summer. But I just wanted to make it crystal clear here. I. Hate. Summer. The warm and breezy air of late spring to early summer turned almost suddenly into a hot and humid one towards the end of June, and it was one of the first really hot days of the year when I met Sigrid who was visiting Japan from Italy. It was our first time to meet each other, and it took place at odd hour of six o'clock in the morning; we were to go to Tsukiji, which almost is a synonym for Tsukiji Fish Market. I had been to Tsukiji in the morning a few times, but this was my first time going into jonai, or the inner market, during or right after the auction. Let's just say I was glad I got out of the place uninjured. It was really hectic - sellers and buyers yelling, carts and trucks running, and tourists and visitors wandering, right and left, everywhere. 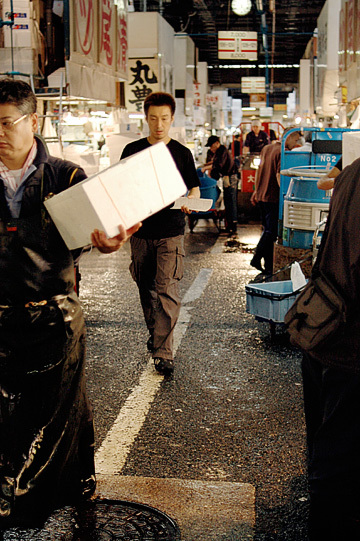 This is the largest and busiest fish market in the country, and probably the entire world. And if I had actually been injured, I wouldn't have been able to complain much; after all, it is the workplace for licensed professionals and they are only allowing us in on the condition that we behave ourselves and try not to get in their way. All in all, it was really intense and overwhelming experience. I didn't take too many photos there, but Sigrid has captured it all in her post here; even if you don't read Italian like myself, her dynamic series of pictures will surely be enough for you to get an idea of what was going on. Then as a muggy June turned into an even muggier July, I headed off to Kyoto. Well, I took my accommodation in Kyoto, but on my first day I decided to make a little excursion to neighboring prefecture of Shiga, which is the home to Lake Biwa, the largest freshwater lake in the country. It was my first time being in Shiga (although I might have passed there en route to somewhere else), and I had never realized how close it actually is from central Kyoto. A train ride of less than an hour from there will take you some of major towns/sightseeing spots in Shiga, many of which sit by or near the lake. My first destination of the day was Mangetsu-dera, or 'full-moon temple'. More commonly known as Ukimido, or 'floating temple', it stands (or should I say 'floats'?) 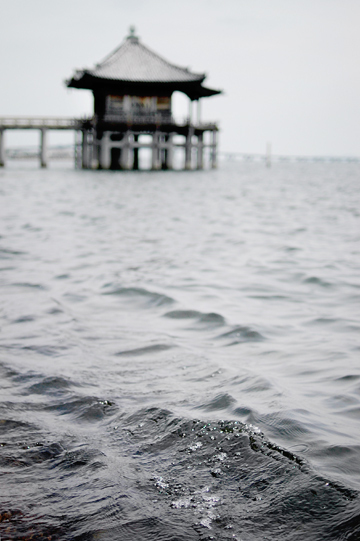 in the lake at a quiet residential area in the city of Otsu. I'd seen pictures of the temple several times before and was hoping to go and see it myself, so I was thrilled to find that the temple is easy to get to from Kyoto. Now, had it been a clear day, the temple would have been breathtaking with the blue sky and water in the background, but it was unfortunately a muggy day with a somewhat dull sky, as you can see in the photo. But it was nonetheless impressive. Being a quiet residential area, the place had little else to see for tourists and alike (unless I was missing something important), but it was nice to stroll around the streets with good old Japan's townscape. Even the few wrong turns I made on the way back to the train station felt fine. After the short stay in Otsu, I hopped back on the train to my next destination: Omi-hachiman, an old town that has served the now-gone hilltop castle from the 16th century. There I walked around a bit and took the funicular to the top of Mt. Hachiman for a quick view of the lake (again, it would have been spectacular on a clear day). On the way back I walked down the hill - and that was when it started raining (typical!). Once back to the bottom of the hill, I took a break at a cafe, and by the time I was done with my cake and tea, I was quite worn out from all the travelling, so I headed back to Kyoto. 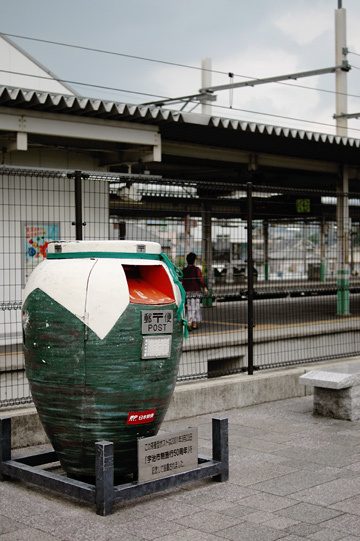 My first day in Shiga was filled with a lot of walking, and scenery both new and oddly familiar. I have some of my photos from the day up on flickr here if you would like to see a bit more of it. My second day in Kyoto was almost just as Kyoto-free as the first one, as I once again hopped on the train in the morning and headed down to Kobe, one of the three largest cities in the region (other two being Kyoto and Osaka), to see my friend Taeko and her family from Italy. They were visiting Taeko's family in Kobe where she's originally from, and it was great to catch up with them, for the first time since last summer when they visited Tokyo. Last time I was in Kobe a couple of years ago, I was also with them and they showed me around the small but beautiful old port city (and I have some photos here, too). 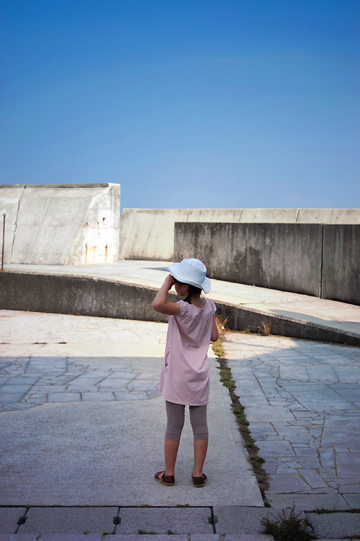 So this time, Taeko suggested that we try and go to Awaji-shima, an island just off Kobe, for a change. I had never been there and knew little about what is there on the little island, but I happily accepted her offer (and a ride) to go there. Turns out, the little island wasn't that little. I had previously had no idea how large it was, but it proved to be definitely larger than I thought it would be. I've just learned that it is Japan's third biggest island (apart from the four main islands that makes up the country, of course), and a friend of mine recently told me it is about the same size as the country of Singapore (which is, um, how big?). We didn't go anywhere particular touristy, but instead had a relaxed lunch, took a walk around a bit by the beach which turned out to be a fishing point rather than for swimming. I didn't take many photos that day, for I was too busy chatting away with my friends from Italy. The irony is, unlike the day before, the weather was gorgeous and the sea looked utterly beautiful - even if it was littered with jellyfish. We spent a lazy afternoon there and then drove back to Kobe, where we ate ice cream by the harbor and then dinner. It was sad to say good-bye to them at the end of the day before catching my train back to Kyoto, knowing that they'd soon be gone back to where I cannot go by train. But I told myself I'd be seeing them sometime soon... and that lifted my spirit a bit. And when I got back in Kyoto around eleven o'clock, I met up with a friend who was joining me for the next few days in Kyoto, and we ended up drinking at a bar until three o'clock in the morning or so. A really late start in Kyoto! My Parisian friend T was in the middle of a month and half-long travel around Japan, and we'd decided that we'd meet up in Kyoto. Being able to see a friend after a while is one thing, but any excuse is welcome to go to Kyoto, if you ask me. Both of us had been to this ancient capital of the country quite a few times, and were done with most of the major sightseeing spots in the central area. So we decided to try less-visited spots on the outskirts of the city. I just said we'd been up for somewhere 'less-visited', but that didn't mean the places we went to were any less significant or lesser-known, really. Our first destination on our first day together, for instance, was Byodo-in temple in Uji, and the building stood just as magnificent as any other big-name temple in central Kyoto. We then went to Tofuku-ji temple; T had never been to this prestigious Southern Kyoto temple complex, and I had but would like to visit again. The thing was, we started the day rather slowly (wonder why...) and by the time we arrived at the area, it was almost 4:30, which means most, if not all, of the temples there were closing to visitors for the day. We still lingered about a bit and walked around on the temple grounds, and ended up coming back for the following morning. T was then off to Tokyo after lunch, and I spent the afternoon on my own, visiting a couple of old residence-turned-museums in the city. Overall, we took it easy and took our time, walking around and clicking away here and there, while arguingtalking about important and petty things (won't elaborate here). All the temples and things were as impressive as ever, but we enjoyed ourselves a lot taking a walk by the river and sitting down with a drink we'd bought from a convenience store. 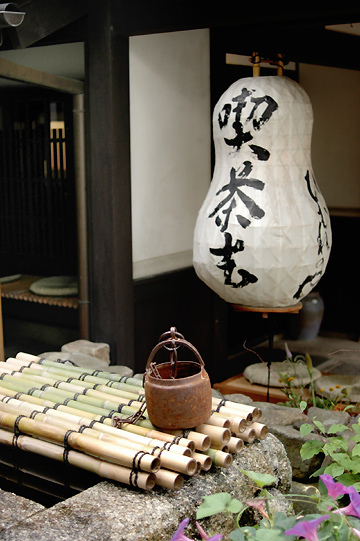 It is common knowledge that summer in Tokyo is hot and humid, but it is even more so in Kyoto. And yet, it was still quite breezy and pleasant in the evening back then. And it being a weekend, lots of people, locals and tourists alike, were out there and enjoying themselves - some of them a bit too much, from the look of it (I don't recommend jumping into the river no matter how slow and tame it appears!). Kyoto was good. Then shortly after I got back to Tokyo, the monsoon season was declared finished for us in Tokyo, and all of a sudden (or so it seemed to me) the temperature climbed up past the point I could really handle, and I was forced into my summer routine: staying holed up in the house, barely alive. At the height of the summer, I rarely go out during the day, and do all the shopping and stuff in the evening when it is slightly cooler and at least no scorching sun. Except that this summer, I had more occasions than ever to see my friends, many of whom were visiting from abroad or otherwise I hadn't seen in a long while. This often involved dragging myself out of the house during the day, but my enthusiasm about seeing them was easily greater than the little comfort of staying indoors. And let's face it, it was just as hot and humid in the house! Is it just me, or is everyone suddenly coming to Japan this year? Earlier the year, my friend Joyce was over from Los Angeles in January (although it was for her to see her ill relative, so I couldn't be all that happy about her being here, but still...). In February, Heidi and Wayne came from San Francisco and I was most thrilled to meet them and spend a day walking around old-town Asakusa and stylish Aoyama with them. From March to April, I was away myself and spent a month in a beautiful little village near London (photos here). May and June came and went in a flash while catching up with Canadian Scott during one of his stints in Tokyo, and then arrived Sigrid and Taeko from Italy, T from Paris, Connie from North California. And most recently, Diane and Todd hit Japan just a few days ago, and I had the honor of meeting the dynamic duo on their first (full) day in Japan, eating ramen and sharing a crepe as we marched through bustling Shibuya and Harajuku. And I've heard a few more friends planning thier visit to Japan later in the year. Some of them were here to visit their families or on business, but it seems as though Japan suddenly became an 'It' travel destination, despite the near-all-time-high Japanese yen. But my point is, with all these great people coming here and incredibly offering to spend some of their limited time here with me, how can I pass up? And I'm glad I didn't. And it certainly helped that they somehow chose to see me on one of milder days, allowing me to stay in and work or do other stuff (or nothing at all) in the severe heat. So on those it-is-too-hot-to-go-out-and-I-have-no-friend-to-see-today days, I'd spend my time working, sorting out stuff, and maybe making (and eating) ice cream, a habit I picked up last summer. Between these, I managed to cook a bit. Which may sound a little odd, but in one summer a few years back, it was so hot I lost my appetite almost entirely and barely ate, further weakening my body to fight the heat. So I consider it a good thing that I am actually cooking (sort of) and eating through the summer. And by 'cooking' I meant noodles. Take the chilled noodles away and there would have been nothing left for me to eat, and I'm hardly exaggerating. That was what I ate all summer - and maybe occasional curries, too. At any other time of the year, Italian pasta dishes would be my favorite, but during these few hot months, warm noodle dishes just wouldn't do. 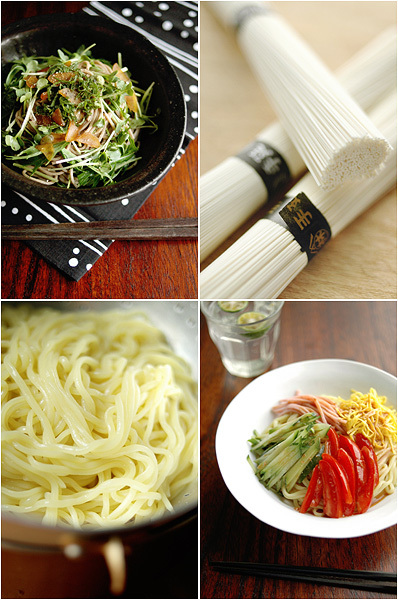 Although regular pasta can be a pasta salad and served cold, we tend to eat lots of Japanese-style noodles during summer, from year-round staples such as soba (buckwheat) and udon noodles to summertime favorites of somen and hiyashi chuka, both of which we associate strongly with summer. These noodles saved us on these days and nights of sweltering heat. These cold noodle dishes may be what we consider as the taste of the season, but speaking of seasonality, there is another thing we can't forget: summer fruits. I may probably have said this in the past, but I repeat: I hate summer. But I cannot but love summer fruits. 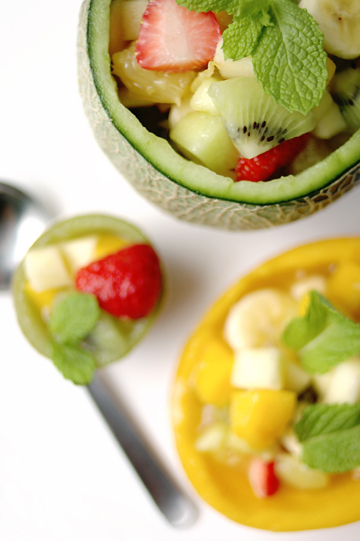 Even when I'm not feeling like eating anything in a sweltering summer morning, I'd have some chilled sweet fruits. My favorites are lychee, cherries, peaches, and figs. This year, watermelon has been good, too. 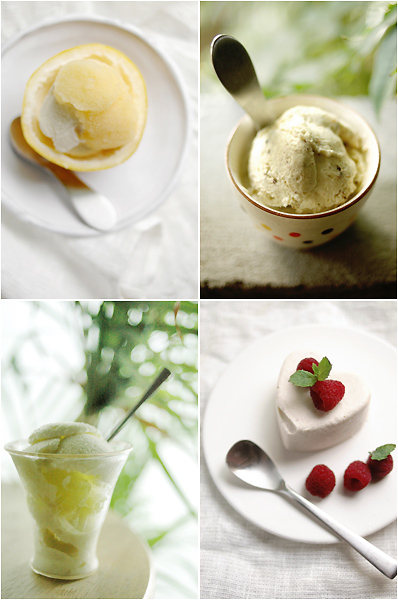 This summer I have been experimenting on making simple fruit ice creams and sorbets, using just a few ingredients that exclude eggs and sugar, with basically no cooking involved. What I used were fresh fruits, heavy cream, and honey (occasionally agave nectar), a bit of liquor or spirit (I liked using gin), and sometimes a bit of juice of lemon to balance sweetness and tartness. I have also tried making them with pineapple, peaches, watermelon, and orange, and have achieved mostly consistent results with more of this or less of that, although some fruits seemed to work better than others. I was hoping to do a detailed write-up about my experiments, but I'm afraid I don't seem to be able to do it before the summer is completely over, so here is just a brief one: 1-2 cups (240-480 ml) pureed fresh fruits (I usually go halfway between and do with 1.5 cup/360 ml); 1 cup (240 ml) heavy cream; 4-5 Tbs. (60-75 ml) honey; and 2 tsp. (10 ml) liquor/spirit. Puree the flesh of fruits and add the honey and liquor. 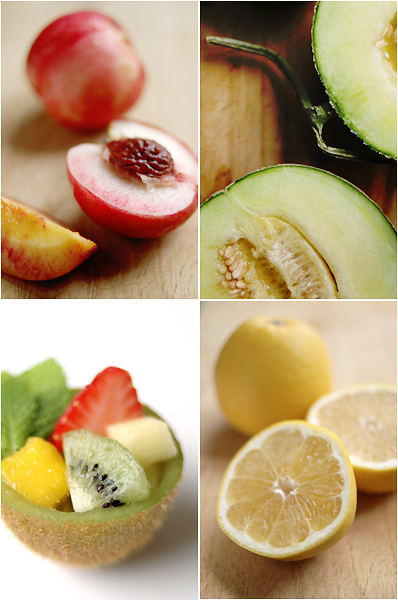 Freeze the fruit puree mixture until set, then break it into pieces and process in a blender until smooth. Lightly whip the cream and add to the frozen puree mixture, and mix thoroughly. Taste and check the sweetness, and add honey if needed. Once again freeze until set, break into pieces and process in the blender. Freeze another few hours or until ready to serve. 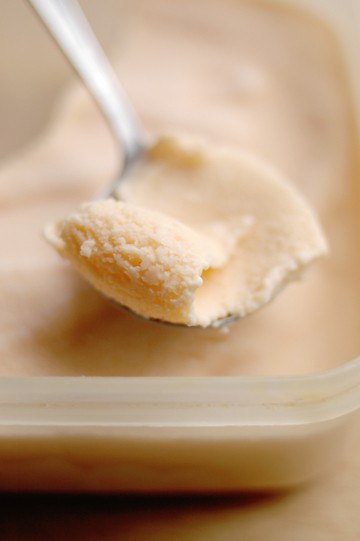 If the ice cream becomes too hard to scoop, move it to the fridge or room temperature a little before serving. If you omit the cream (and maybe use a bit less honey) and continue freezing after the first round of blender-processing, you'll have sorbet. So in the name of 'experiment' I seem to have eaten my way through more ice cream than I would like to admit over the summer. But my first choice of refreshments to cool me down wasn't ice cream but teas of all sorts, usually not iced but just at room temperature, and almost never sweetened. I drink tea a lot throughout the year, more often hot than chilled. Even in the summer, I don't drink ice-cold teas too much but instead have them at room temperature. Lots of people make tea in a large quantity at a time (or maybe just buy large bottles of tea from the store) and keep it in the fridge, but our fridge here is tiny and hardly has room for a large jug, so I make my tea a cup at a time. On a typical day, before I go to sleep in the evening (or in the morning as the case may be) I'd throw a teabag in a mug and pour filtered water that has been boiled and then cooled, and leave it to 'brew' overnight. When I wake up in the morning, I have a fresh(ish) mug of tea ready to drink. My go-to first-thing-in-the-morning tea of late is a lemon & grapefruit-flavored herbal tea (like this) from British supermarket Sainsbury's. This refreshing pink infusion was a favorite of a friend of mine in London, and I've been copying her ever since I tried it first at her house a few years ago. Another herbal infusion that is equally refreshing and perfect for summer is fresh mint tea. Now I'm not a big fan of mint tea, the kind that is dried. I occasionally find it soothing and calming especially when I have a full stomach, but otherwise it's never my first choice of tea. But when made with fresh mint sprigs, it makes about the cleanest infusion around, free of the taste that you get from dried leaves that tends to put me off. And this must be a perfect way to get rid of mint growing wild in your frontward or in your planter. All you need is to grab a handful of sprigs, rinse them, and add boiling water. I've been enjoying this tea a lot over the summer, but in the beginning it was mere a byproduct; I was to blanch mint leaves for other uses, and thought about adding water to a cup of mint, instead of adding mint to a pot of water. This worked, and I've never looked back since. 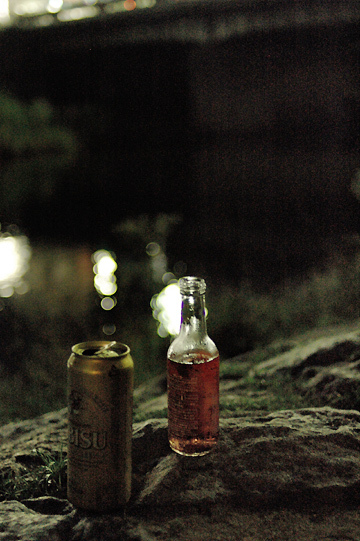 The other day my sister and I went on a picnic by the river close to us, something we have been doing at least once every summer for the past few years. That day both of us made a slow start, and by the time she was done with her stuff and I was dome with prepping food, it was beginning to become dark outside, and soon it was too dark for me to take a serious photo. But it was a hot one during the day and it cooled down a lot in the evening, so it worked out good for us to eat and drink outdoors. We took a bottle of sparkling wine with us, and my honey-ginger syrup and one of the lychee liquor that I'd made two months ago, along with a bottle of store-bought ginger ale. I wanted to try my honey-ginger syrup with sparkling wine, and I was pleasantly surprised to find that the syrup actually made ginger ale that is a lot closer to the 'real' stuff when topped with sparkling wine instead of sparkling water (woo-hoo!). We tried the lychee liquor first with the wine and then with store-bought ginger ale, and both tasted good, though we should probably have used a little more liquor to taste the lychee flavor. Then again, it might have been just that we were both too drunk to taste anything. On the food front, I hadn't been very inspired about the menu for the day apart from dessert - I made tiramisu the night before. Then it suddenly occurred to me in the afternoon of the day, and I whipped up pasta with dried tomato pesto and a green bean salad, both of which came from the ever so inspiring Heidi's site. I'd had some bread rolls with which I meant to make sandwiches. It never happened, but I took them along, all the same. The salad was good with herby and creamy dressing, but the pasta was outstanding. The recipe calls for "slightly plump, pliable, chewy" sun-dried tomatoes, and I had ones exactly like that, brought to me from Italy kindly by Sigrid. I used pine nuts because I was out of walnuts, but it made one really toothsome pesto, full of flavor with almost a hint of meatiness. I used asparagus instead of spinach and skipped cheese altogether, but it made a really satisfying dish. You top it with oven-roasted cherry tomatoes, for which I did what my friend Eric did with semi-dried tomatoes a while ago: dusting the tomato halves with pulverized dried mushrooms. He used shiitake mushrooms, but it happens to be something I cannot stand, so I used dried porcini instead, grinding them in the blender. The roasted tomatoes didn't taste much of mushroom, really, but they were extra flavorful and incredibly sweet. As for the dessert, despite its misleading appearance topped with frozen raspberries and shaved white chocolate in the photo, it was cherry and fig tiramisu. It was more or less the same as the one I'd made before, but I folded (rather than blending thoroughly) some mashed figs into the mascarpone cheese mixture, and added shaved white chocolate between the layers of the cheese mixture, ladyfingers dipped in citrus-scented tea, and slices of fresh peaches. I kept the finished tiramisu frozen until leaving the house, and by the time we were ready for dessert it was partially thawed, making it a nice mixture of frozen and chilled fillings. It was good. The picnic I think may have been the last event of my summer this year, chronologically, but there was another thing that had taken place a week before, which might as well have been the de facto end-of-summer event: fireworks. 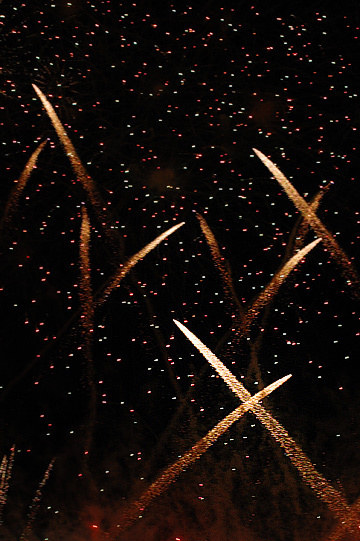 Every summer on the river bank near us, there is a large fireworks show - or two shows, really, that are held concurrently on each side of a bridge, organized by two neighboring cities. They (especially the one on our side) take place so close to our place it feels almost scary to hear the noise of the fireworks going, even in the house. We can see some of them by the window, but this year I decided to go to the site and watch them right in front of me. And by that, I meant, really right in front. I brought a drink and some snacks from home, but ended up buying an expensive pack of less-than-decent takoyaki...that is part of fireworks viewing experience in Japan, you know. And I walked around the site a bit and spotted a group of organizers, official-looking photographers, and an area reserved for 'invited' guests, so figured it was the prime viewing spot. I secured a small spot right by the off-limits area, where I saw a few platforms, less than hundred of yards or so away from me. I was excited. 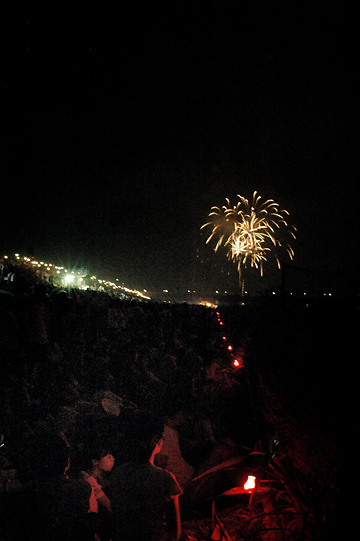 The spectacle lasted for an hour, and it went by in a flash as I was immersed in watching the strings of fireworks going up while clicking away my camera, barely looking into the viewfinder. I didn't want to miss it all while it is all happening in front of me, and just hoped some of my photos would turn out decent. Well, there weren't many such shots (no surprise...), but I have put together a sideshow here if you would like to get a tiny glimpse of the massive shows. Somehow all the photos that turned out alright were more or less peculiar-looking, and if you are up for something a little more typical-looking fireworks, try these, from the same fireworks show a few years ago when I made a little more effort trying to take photos of them. As the shows take place in mid or late August every year, when it is over it feels like the summer is finally nearing its end. I used to savor that end-of-summer feeling in a mixture of sadness and relief, but for the past few years there has been only relief. And yet, this year, as I look back the past months like this, I don't feel sad but do feel that I actually had a good summer. Well, the summer itself wasn't that good, but what I had over the course of these summer months was great. To tell you the truth, I have been meaning to go to Nagano to spend some time there, and I should have been there in late June, according to my original plan. Now it is already the end of August and I am still here in Tokyo, missed the chance to have a cooler summer in the mountainous countryside, where it is already beginning to be chilly, no doubt. I'm still going to go to Nagano all the same, but I am glad that I ended up remaining here, for all these opportunities to see my friends when they were around in Tokyo. Ice creams and teas and noodles did help me survive the heat, but it was more because of you that I have been able to enjoy the summer. So THANK YOU. And for all of you whom I didn't get to see this summer, or whom I have never even met, I would still like to thank you for dropping by, and I hope you all have had a great summer (or winter, if you are in the other hemisphere). You have a wonderful blog! The stories that you tell are captivating and of course, your photos are beautiful :-) Here in Malaysia, it's always warm and muggy. It gets a bit better during the rainy season though. This is why my husband and I always go to cooler climates whenever we travel. Wow great photos! 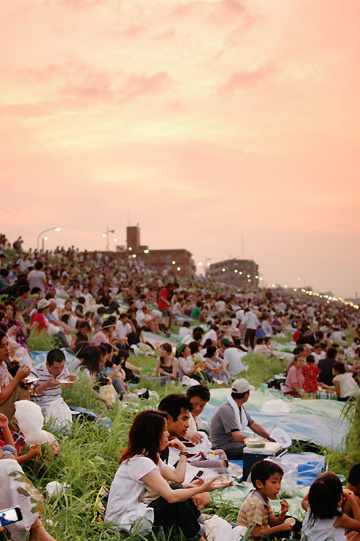 Seeing your photos of the hanabi made me feel nostalgic for my childhood summers in Japan. I just came across your blog from a White on Rice Couple. Glad they linked to you and I am totally trying out that ramen shop when I'm in Japan in October. 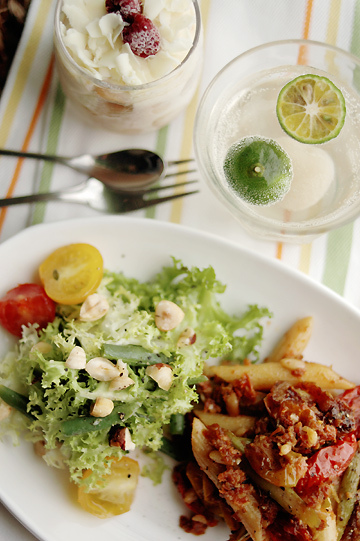 I love reading your blog--your food photos are so mouthwatering! And the fireworks picture you've posted make me long for a little more summer. Autumn is my favourite season, but this year I don't want it to come quite yet. 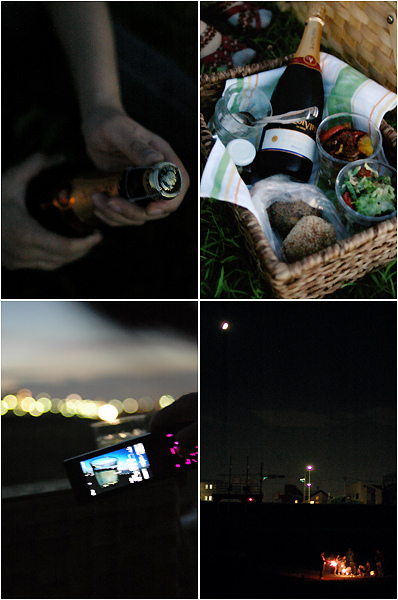 I want a few more weeks yet for languid picnics and summer-night kisses. 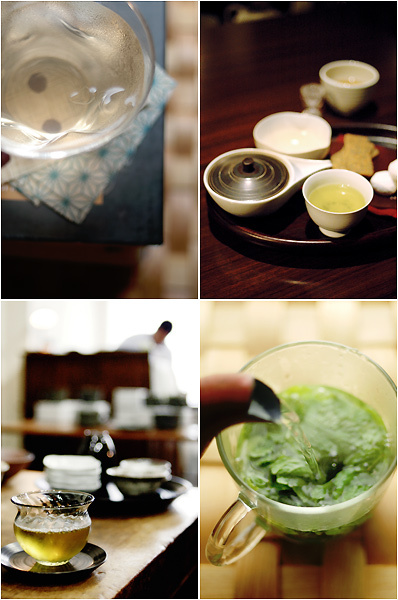 On another note, have you tried making a tea concentrate? Similar to your ginger-honey syrup, except with teas or herbs. The idea is not my own (or new in the least), but has hit the blogosphere lately. It's very practical for someone with just a little fridge space. I am far more likely to pull out a quart or pint jar for tea than to even have room to fit a gallon jar in my fridge. and her commenters have a few tips to add. Enjoy! Amazing post, totally fed my dream of Japan. I can't wait to visit some friends in Tokyo. Besides I can't wait to experiment with the ice creams, I don't own a machine and was never brave enough to try to make them without one. Marc - oh october should be great here! i take that you are originally from kyushu? let me know how you thought of jangara if you ever try there - they say theirs are not authentic kyushu ramen but one that has been adjusted to the taste of people in tokyo, i.e. broths a little lighter, etc. Janine - thanks for the tip! i sometimes make very strong tea and dilute it water as i drink, but never make it that much. Sigrid - lol! i should have thought about it before being born in japan! 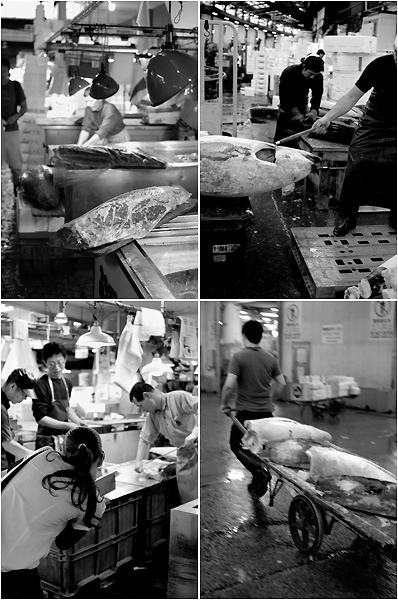 ;p it really was tough taking photos at tsukiji, and i guess you did a fantastic job. Found you through White on Rice Couple, and I love your photos, particularly the travel ones. I'm going to Japan in November (trip number 5) and so am doing some research for the trip. So glad to hear my country mentioned in your gorgeous blog. I am from Singapore and it really isn't big - around 700 sq km? Have been reading your blog since eons ago and when I revisited it again, it still doesn't fail to leave me in awe of your lifestyle.